Are you a developer or consultant looking to incorporate best practice water cycle management into your new residential development? This half day practical workshop will introduce you to the new Urban Water Cycle Planning Guide – an exciting new tool to help urban developers, consultants and planners incorporate Whole of Water Cycle Management principles into new developments. 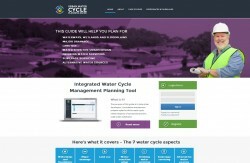 Developed by the Barwon Region Integrated Water Cycle Management (IWCM) Network with support from the Smart Water Fund, the Urban Water Cycle Planning Guide explains all aspects of water related development and outlines how to proceed though the planning process on these matters. By working with the relevant agencies and incorporating IWCM principles early in the process, developers and consultants can save time, resources and money. The session will start with an introduction to the concepts of urban water cycle planning and why it is necessary for new residential developments. The session will then explain how the Guide can assist developers and consultants with their water cycle planning and how the Guide works. Participants will then be invited to have a go at using the Guide, individually or in small groups, working through a real life case study. The project team will be on hand to answer any questions you may have. The workshop will also provide an opportunity for networking amongst participants, providing a platform for closer working relationships between developers, consultants and council planners. A relaxed lunch will be provided at the start of the workshop to help foster this and an interactive discussion session will be held at the end to share ideas on how the Guide could be best applied, any improvements required and any other actions needed to progress improved urban water cycle planning for new residential developments in your region. This is the first of three half day workshops being delivered across Victoria. If you can't attend this session in Geelong, make sure you visit Clearwater's tailored training and upcoming events page where you can register your interest to attend the two remaining workshops. Ideal for developers and consultants working on the design of new residential developments in Geelong and the South West Region, and for council planners and engineers from Geelong and the South West Region involved in the urban water cycle planning process. The workshop will be facilitated by Clearwater and Barwon Water. It will include presentations from the Office of Living Victoria, the Smart Water Fund and the Urban Water Cycle Planning Guide project team (Barwon Water and City of Greater Geelong). Registrations are essential - places are limited.